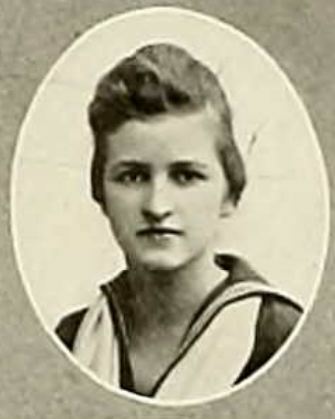 Evelyn Thom as a student at Salem College (Winston-Salem, NC), 1917. 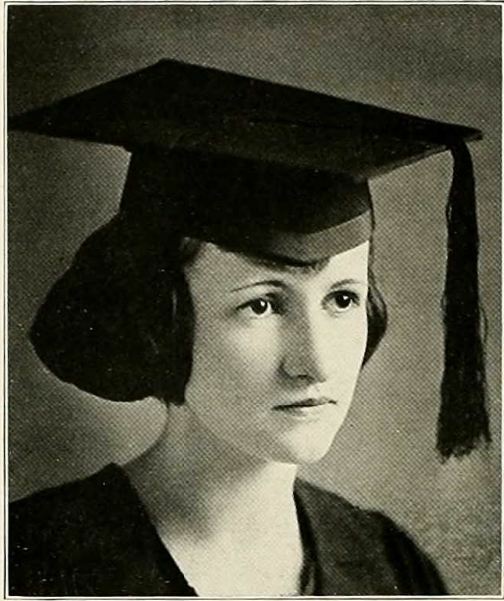 Evelyn Thom as a senior at Salem College (Winston-Salem, NC), 1921. 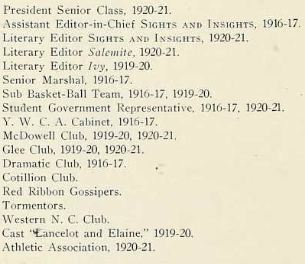 Honors while attending Salem College (Winston-Salem, NC), 1921. Eveyln Thom Spach creating a fruit arrangement at Old Salem. Mrs. Spach maintained Old Salem’s Miksch House gardens for many years and provided flower arrangments at many museum events. She served as president of the Garden Club Council of Winston-Salem and Forsyth County from 1960 to 1962 and twice served as president of the Old Salem Garden Club. www.digitalforsyth.org. 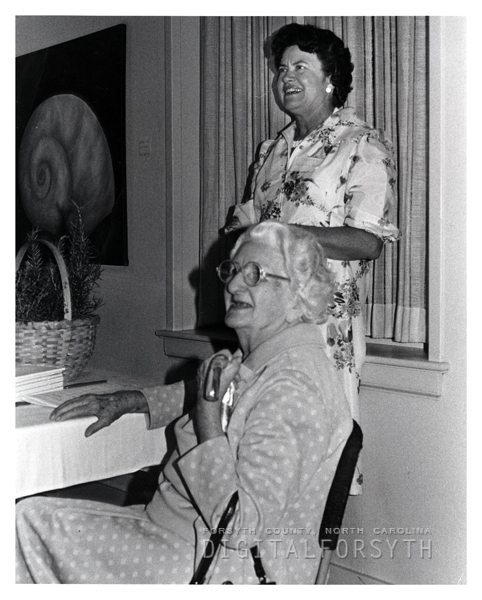 Evelyn Thom Spach (seated) and Flora Ann Bynum was taken at the release celebration of Mrs. Bynum’s book “Old Salem Garden Guide.” Eveyln Thom Spach maintained Old Salem’s Miksch House gardens for many years and provided flower arrangments at many museum events. 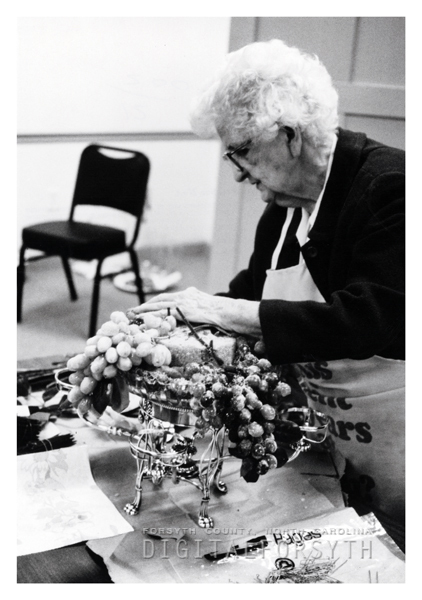 She served as president of the Garden Club Council of Winston-Salem and Forsyth County from 1960 to 1962 and twice served as president of the Old Salem Garden Club. 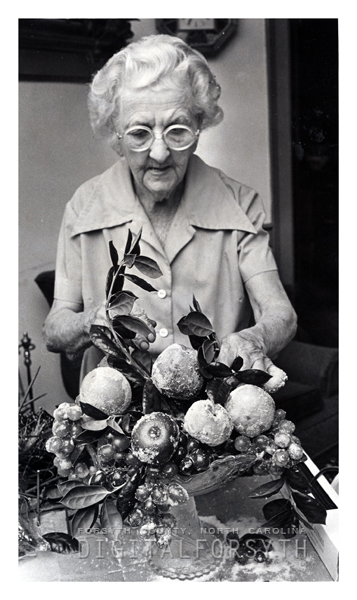 Flora Ann Bynum (1924-2006) was a noted horticulturist, author, and historic landscape expert. www.digitalforsyth.org. Winston-Salem Journal (Winston-Salem, NC), June 5, 1921, p18. China Grove, June 4. 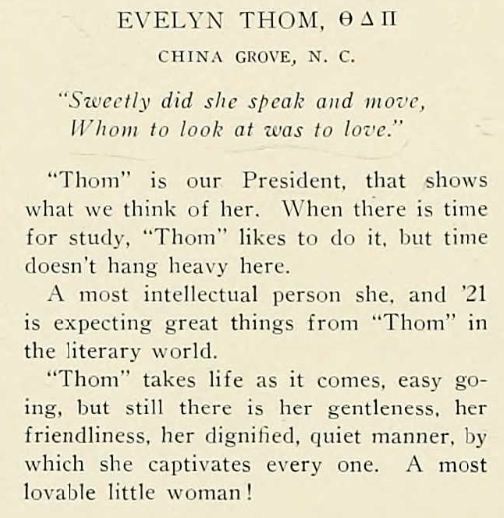 – On the evening of June 1 at 8 o’clock in St. Marks’ Lutheran church, China Grove, Miss Evelyn Thom, Daughter of Mr. and Mrs. J. A. Thom, was given in marriage to Mr. William M. Spach of Winston-Salem. Rev. Oscar F. Blackwelder, of Roanoke, Va., assisted by Rev. C.  Fisher, pastor of the bride, officiated. The beautiful ring ceremony was used. The church was beautifully decorated with magnolias, carnations, English ivy, and ferns, and softly lighted with Cathedral candles. Preceding the ceremony Mrs. Roy Kimball, cousin of the bride, sweetly sang, “Because.” Piano accompanist, Miss Evelyn Smith, of Kershaw, S. C.; violin, Miss Ada Stirewalt, of China Grove. The three were attired in orchard taffeta with corsage of roses. The bride’s only attendant was her sister, Miss Ruth Thom, who wore a beautiful frock of orchard taffeta and carried a bouquet of Russell roses. The bride entering the church on the arm of her father, Mr. J. A. Thom, who gave her in marriage, was handsomely gowned in duchess satin and princess lace, with court train, her tulle veil being caught with a wreath of orange blossoms. She carried a lovely bouquet of orchards with shower of valley lilies. The bridgroom’s gift, a crescent of diamonds, was worn by the bride. The wedding march was rendered by Miss Evelyn Smith, class mate of the bride. Mr. Spach was attended by Mr. Raymond Taylor, of Winston-Salem, as best man. The ushers were Messrs. Cash, Spach, McGowan, and Dalton, all of Winston-Salem. The bridal party were entertained at the home at a 5:30 luncheon. the attractive feature was cutting the bride;s cake. Miss Thom and Mr. Spach are popular in the social world, their popularity being shown by the numerous and handsome wedding gifts received. Mrs. Spach was educated at Salem College, graduating May 31, class ’21. Mr. Spach is an alumnus of Trinity College. Upon their return from their wedding trip Mr. Spach and his bride will make their home in Winston-Salem.